Ground broken for Ismaili Muslim landmark - 2010-05-28 | Ismaili.NET - Heritage F.I.E.L.D. Nizar Kassam drove all the way from Chicago to Toronto to witness yet another “groundbreaking moment” of the 70,000-strong Ismaili-Canadian community Friday. The 66-year-old Tanzanian-born Ismaili businessman was in town for the foundation ceremony of the new Ismaili Centre, the Aga Khan Museum and Islamic park, to be located on a seven–hectare site at Wynford Dr., near Eglinton Ave. E. and Don Mills. “It’s a privilege for the community to have a home. 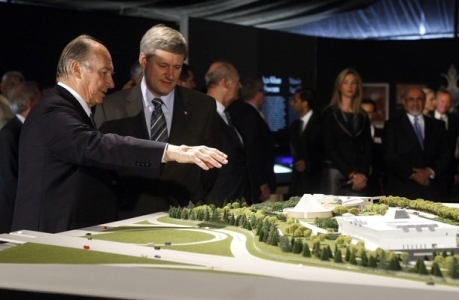 This is a groundbreaking event not only for the Ismaili community but everyone in Canada,” said Kassam, one of 800 guests at the ceremony held in a gigantic carpeted and air-conditioned white tent set in an empty field. “If I may say so, sir, you sound like a Canadian,” said Harper, before presenting the Aga Khan with an honorary Canadian citizenship certificate for his life-long humanitarian and developmental works. The Aga Khan told the assembled guests those shared values make him feel right at home here. “You have been part of a distinctive observance — celebrating effort, which is impressive in scale, in aesthetic ambition and in its cultural inspiration — contributing in the best way possible to Canada’s pluralism,” he noted. Calling the ceremony a “momentous occasion,” community member Saleem Dedhar hopes the museum will allow Canadians to view Islam through a new lens. “This will showcase who we really are,” said the Toronto engineer, whose family, like many Ismaili Muslims, fled persecution in Africa in the 1970s.